My name is Hollyn and I am the digital content intern at Eos Nonprofit Consulting for Spring 2017! I am a born and raised central Indiana girl. Nothing gets me more excited than a bonfire and the smell of corn in the summer. My family consists of three other humans...mom, dad, and brother...the MVP family is our 4-legged friend, Barney (see slideshow below). Barney was a rescue beagle who has stolen our hearts, one peanut butter jar at a time. 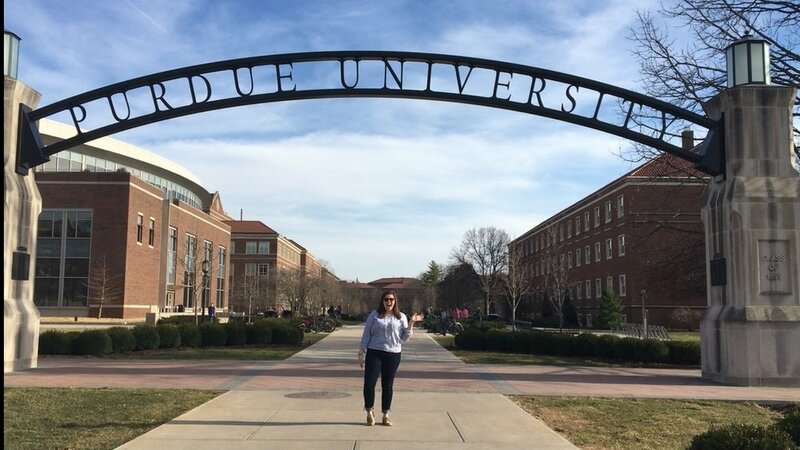 I was born to be a Boilermaker and I will be ecstatic to call my Purdue my alma mater this coming May. I will be graduating with a degree in Public Relations and Strategic Communications and a minor in Political Science. On campus, I am involved in a multitude of activities including my Cooperative House, Twin Pines, the College of Liberal Arts, and the Purdue Cooperative Council, where I serve as president. Memory: Helping to handle the American Bald Eagle, Challenger, that flew over the Indianapolis Motor Speedway during the 100th running of the Indy 500 this past May. As a senior in college, I get lots of questions about “what I am to be when I grow up” and the truth is, I’m still figuring it out. I have spent my past two summers working in the sporting industry of Indianapolis, first at Indiana Sports Corp. and then at the Indianapolis Motor Speedway this past summer. I have found a love for impacting the community around me and what the world of sports can do for the community around it. I am excited to see what the next few months hold for me and where life is heading! In the meantime, I am pumped to be spending the next few months working with Kristen and hanging out with you guys on Facebook, Twitter, and the blog. Make sure to say hi and let me know if you have anything you would like to see! So you're starting to think about getting involved in your community. Congrats! One of the best ways to get involved in your community is to volunteer. The task of volunteering can be overwhelming at times and sometimes people quit before they even get started because they don’t know where to begin. Here are the top three things to keep in mind as you begin to connect to your community and the world around you. This is the time to figure out what you care about and to start looking for missions and organizations that match your passions. Figuring out what your passions are is a great way to figure out which organizations you want to not only give your time to, but also your charitable giving. Do a little research and see what local, state, national, and even international groups are helping to achieve a dream of yours. Maybe you want all dogs to have a forever home—there are a lot of different organizations that work to place dogs in permanent homes on all levels. Look at all organizations everything from your local no-kill shelter to the National Humane Society. Determine which groups are most effectively getting the world to a place you dream of. Narrow your interests and skills before you go to an organization. What do you want to do to help the organization? What skills do you have to offer? Make sure you know what you want to do to help the organization and what you have to offer. Often, people believe they should volunteer a skill set that they do regularly and are good at, but you can also volunteer a skill that you exercising, but don’t often have time for. This gives you an opportunity to shine, and ensure you don’t get burnt out while you are volunteering! After you have narrowed your interests and determined what kind of organization you want to volunteer with, it’s time to find your perfect match! Take the time to search the internet for organizations in your area or call your local United Way chapter to get a sense of who they partner with. If you are looking for a larger database to pull from, take a look at idealist.org and volunteermatch.org. As you search for a fit, start small in the time you give. Make sure to test the waters at multiple organizations and see what fits you the best! Don’t forget to think of yourself when you’re volunteering! Make sure that as you test out organizations they are as interested in you as you are in them. It should be a mutually beneficial relationship. Make sure that the work you are doing is appreciated. We all know that when you're volunteering, it isn't for the glory, but it’s still important to be appreciated. If you want more information about volunteering, check out our Facebook LIVE video here! If you'd like to support efforts to help our returning military veterans at home, you could donate directly to a number of national or local charities that provide great services. Or you can buy an $800 washer/dryer pair at Sears and have the retailer donate $20 of that. Because #America. That's right, friends. A company that is on the brink of bankruptcy is trying to cash in on goodwill toward our troops to sell appliances. If you'd like to read more about it, here's the article my friend linked to. Here's the deal: corporations and for-profit business have a long history of using causes to boost sales. In the case of restaurant fundraisers, where 10-15% of a customer's bill goes to support an organization on a given day, I think it's a good fit for schools or small organizations that don't have the manpower or expertise to fundraise. In fact, most of the time, these arrangements are beneficial to both the business and the nonprofit. Nobody's winning big, but everyone is winning. The problem with this initiative from Sears is that the amount going back to charity is abysmal. Only 0.05% of the total cost is actually being donated. Look, the organization that Sears is donating to will be glad to receive up to $200,000, and will certainly do great work with the funds. Rebuilding Together is a national nonprofit with local branches, including one in my own community. It's a worthy cause. It's an odd choice for this initiative, considering it doesn't exclusively serve active military or veterans, but it's still a great organization. 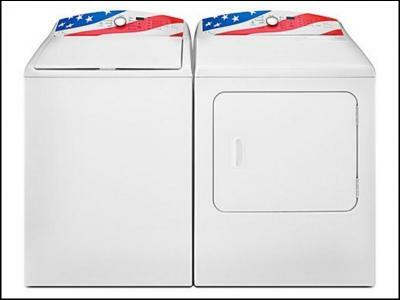 Rather than purchasing one of these washers or dryers for your feel-good moment of supporting the troops, do a little research and make a direct donation to any one of the more than 400,000 nonprofits that serve our military. If you don't know of an organization that serves troops in your community, call your local United Way or a local community foundation to see if they can point you in the right direction. CharityWatch and Great Nonprofits both have good resources to find national organizations, but I recommend checking out Charity Navigator, where you can find organizations that serve military families, provide social services or support wounded troops. And hey, if you're going to give a gift directly to a nonprofit organization, but still need a washer and dryer, check out your local Habitat for Humanity ReStore, where you might be able to find a great bargain and support another local nonprofit. A final thought for nonprofit leaders: Promotions like these are not a healthy thing for the world of nonprofits. In this field, we're always fighting against negative perceptions of high salaries and boycotts due to overhead – you'll soon start seeing the misleading, inaccurate and out-of-date chart circulate amongst your Facebook friends which tells you which nonprofits to avoid this holiday season. We're always fighting to demonstrate our missions are worthy of a person's hard-earned and usually stretched dollar. It's our responsibility in the nonprofit world to set the standard regarding donations. And this standard is absurdly low. So initiatives like this, where a company is donating less than one percent of the buyer's total cost, are damaging. We must demand better.